Some tourists have a particular purpose in exploring tropical countries like Indonesia, which is to enjoy natural adventures. In this case, visiting Burni Telong Crater would be a good idea for these people. The location is in Bener Meriah Regency and it belongs to Aceh Province, Indonesia. In a nutshell, Burni Telong is an active volcano and it becomes an interesting place for exploration and hiking. People also come to the location to enjoy photography, in fact. Despite its active status, the volcano doesn’t stop tourists from coming and exploring the site. Are you interested? The main charm of Burni Telong Crater is definitely the scenery. The mountain has the height of about 2,624 meters above the sea level and there are two ways to get to the crater. The first route starts from Sentral Village in the southeast slope. Another route is located on the southwest slope, which is accessible from Bandar Lampahan. Most of the visistors use the second route when it comes to trekking, though. It takes about 3-4 hours to reach the crater. Along the way to the top, you might pass through a forest and local coffee plantations too. Many types of activities can be done in Burni Telong, especially trekking and enjoying natural attractions. For those who love to explore unique plants, they can enjoy a good time there for sure. The reason is none other than the presence of wild orchids, which can be found before the Edelweiss field. Before reaching the crater, do not forget to visit a small cave near to such field too! Due to the presence of those natural attractions, all tourists should not forget to carry a camera when exploring or hiking. Trekking is the main activity for tourists to enjoy in Burni Telong Volcano. 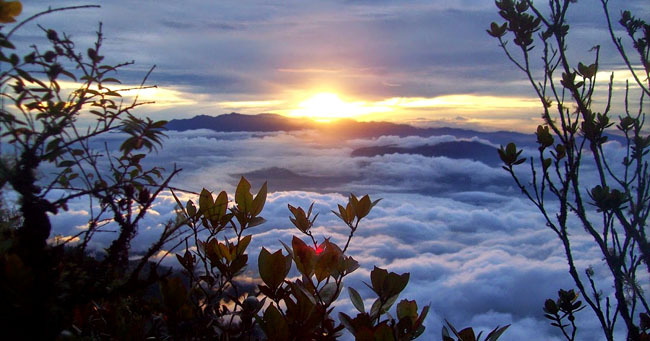 The fact is that the mountain belongs to the top 10 highest mountains in Aceh Province! No wonder, lots of people are interested to get a new experience on the site by exploring the mountain. Both beginners and experts are allowed to come to the site, after all. As long as they come with proper equipment and ample supplies, everything is fine. For a safer and more efficient trekking, though, it is recommended to come with a tour guide. In terms of name, it means burning mountain or “Gunung Terbakar”. The thing is the volcano hasn’t erupted yet recently, and the government gives much attention to its activities considering the potential damage it might cause in the future. As for tourists, the mountain becomes a challenging place to explore, though. Despite it provides an interesting landscape for trekking, everyone should pay attention to the route and should come with a good stamina. Also, it requires good concentration to conduct trekking there. For those coming from Banda Aceh City, a trip to Bener Meriah Regency takes about 7-8 hours and the distance is 318 km. As for the route, the best one to take is Banda Aceh Street and Raya Bireuen – Takengon Street.